Do you have a question about your cat’s health or behaviour? Join our regular Facebook Q&As with feline experts, taking your live questions. Last week Behaviour Manager Nicky Trevorrow answered queries, some of which are highlighted below. Question: Why is my 11-year-old cat still scared of my husband who has lived with us for seven years?! He feeds her, strokes her (when she very occasionally is brave enough to sit near him), he talks to her, and yet she still runs a mile if she thinks he's going to be anywhere near her. I'm baffled. Question: Why has my outdoor cat suddenly started peeing near our front door? He still goes out, isn't ill and gets along fine with the other two cats. And it isn't every day. We've tried all sorts to get him to stop. Cats sometimes spray short bursts of urine on vertical objects outside to mark territory and leave information for themselves or other cats to ‘read’. 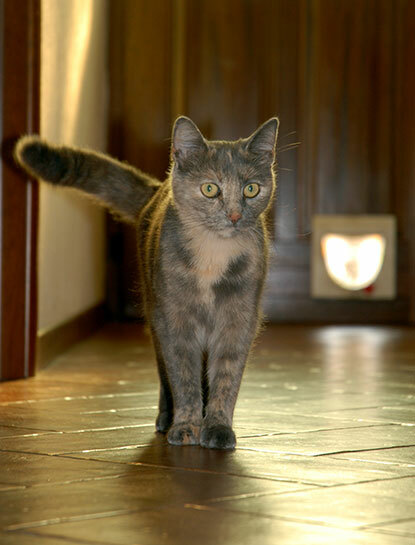 If your cat starts to spray inside the home, then it is almost certainly a sign that all is not right in their world. Trying to identify signs of stress or other factors that may cause a cat to spray can be very tricky so we'd recommend that you seek the help of a professional behaviourist (use www.apbc.org.uk). Question: My younger, more confident cat insists on pouncing on my older, nervous, diabetic cat, jumping on his back and chewing the older guy's neck whenever they're both indoors together. Both are male and neutered. We have used water spray on the young boy and told him 'NO' at the time of each incident but it's not having much effect. Any reason for the younger guy's repeated dominant behaviour? Any idea what we can do to help sort it? Answer: It's good that both boys are already neutered. It's hard to say for sure without seeing your cats and witnessing their behaviours for myself. Depending on how young your other cat is, he may be feeling very playful and particularly with the bad weather lately, many cats can feel bored, stressed or frustrated from staying indoors more. Try giving your younger cat lots of frequent interactive play sessions with fishing rod toys to keep him occupied and burn off some excess energy. Also give your older boy some quality time with just you (when the younger cat is not around) so he too can enjoy some gentle play and fuss. Toys with feathers on the end are great for all cats but especially nervous ones. Always store the fishing rod toy out of reach after play has finished. Would you like to ask one of Cats Protection's feline experts a question about your cat? Don't miss the next live Facebook Q&A sessions: Vet Vanessa Howie will be taking questions on 4 February; Neutering Manager Jane Clements will be hosting on 18 February; and Nicky Trevorrow will be back answering behaviour questions on 3 March. All Q&As are held on Cats Protection's national Facebook page from 2-3pm. See you there!